If there is one thing that strikes fear into many translators and interpreters, it is marketing and selling their own services. Yet, if there is one thing that many translators and interpreters love, it is writing and talking about their work. If there is one thing that strikes fear into many translators and interpreters, it is marketing and selling their own services. Yet, if there is one thing that many translators and interpreters love, it is writing and talking about their work. This hands-on session will show how our love of writing and speaking can be turned into pitches that clients love and which make them want to hire us. 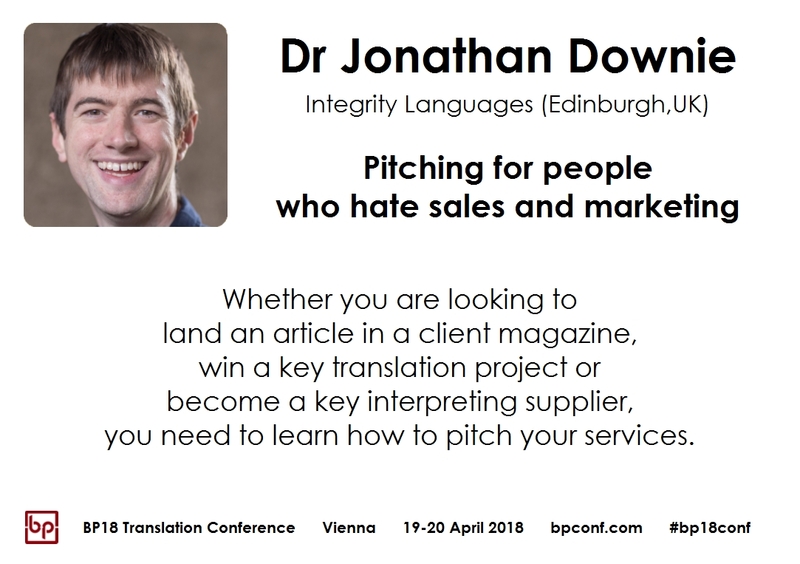 Dr Jonathan Downie is a consultant interpreter, researcher and author on interpreting. His first book, Being a Successful Interpreter: Adding Value and Delivering Excellence was published by Routledge in 2016 and won Best Interpreting Book at the ProZ.com Community Choice Awards. Dr Jonathan Downie is a consultant interpreter, researcher and author on interpreting. His first book, Being a Successful Interpreter: Adding Value and Delivering Excellence was published by Routledge in 2016 and won Best Interpreting Book at the ProZ.com Community Choice Awards. He has also written for several client-facing magazines and publications such as Flybe’s Flight Time magazine, the Conference News and Eventopedia blogs, Executive Assistant and Executive Secretary magazine.